Staff Photo by Dan Henry / The Chattanooga Times Free Press- 12/7/16. 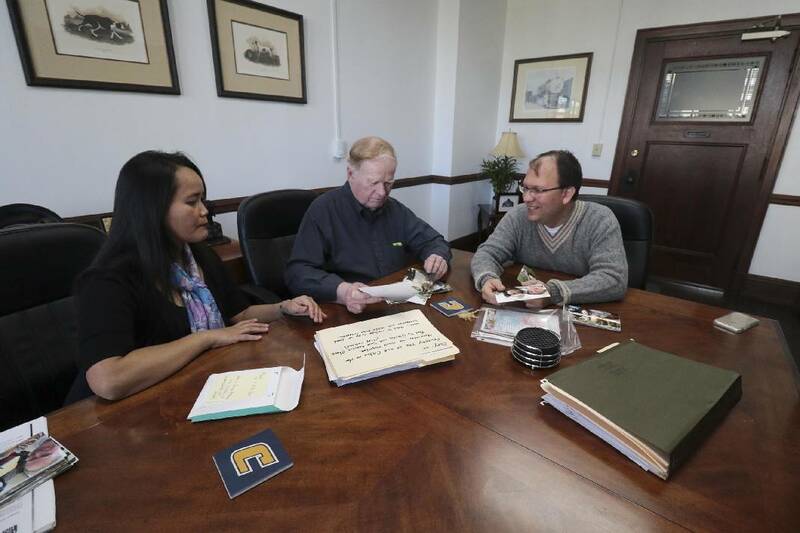 Immigration Attorney Terrence L. Olsen, Esq., right, reviews photographs with Glenda and Lewis McCrary as they prepare to apply for a permanent resident card within the next year. POLL: Do you support Donald Trump's stance on immigration? Donald Trump promised during his presidential campaign to deport millions of undocumented immigrants. Now his election has sent fear through many in the local immigrant community, crowding the offices of immigration attorneys and forcing many immigrants, both legal and illegal, to consider leaving a community they have called home for many years. "I probably have two-and-a-half to three times my normal work," said Terry Olsen, a local attorney and past chairman of the Tennessee Bar Association's Immigration Lawyers section. "It is complete and utter chaos and fear." Attorney Martin Lester, who specializes in immigration cases, agreed. "The level of fear and anxiety that a lot of our clients are dealing with has grown tremendously," Lester said. "It's not just adults concerned about family members. It's young people, even people who are born in the U.S. but whose parents are undocumented immigrants, worried about coming home from school and finding their parents gone. What makes it worse is that nobody knows exactly what's going to happen after Jan. 20," when Trump will take the oath of office. "People are beginning to plan for the worst," said one local immigration rights activist who is here illegally and asked her name not be used. "Maybe I do have to go back to Mexico, or move to a city where it's a little safer for me. It was one thing to come up with several state laws against immigrants' rights. It's different when you have the White House against you." Even immigrants here legally often have relatives who could be threatened with deportation. Thousands of immigrants came to work in Dalton's carpet mills in the early 1990s — a time when employers did not look closely at workers' immigration status. The mills were desperate for cheap labor, according to Kennesaw State University professor Randall Patton, who specializes in the history of Georgia's carpet industry. The hard-working machine operators, mostly from Mexico, helped consolidate much of the nation's carpet business in Dalton. Today, an estimated 80 percent of the nation's tufted carpets are produced in the North Georgia town of 34,000. The children of Mexican millworkers who were born in the U.S. are automatically U.S. citizens, and many have moved beyond the mills to obtain college degrees. Dalton State College's Hispanic enrollment has gone from less than 3 percent in 2000 to almost 25 percent. And Dalton Chamber of Commerce President Rob Bradham said the 2008 recession, which decimated the carpet industry, didn't lead to an out-migration of Hispanics. "Our Hispanic community here is generally not transient. A lot of the families here have been here for two, three generations, they have put down roots here," Bradham said. But that community is now threatened. If undocumented parents are threatened with deportation, their children will face a difficult decision — stay here and pursue lives in the place where they grew up, or accompany their parents to a foreign country they have never known. Maria, who asked that her last name not be used, is 24, a college graduate with a good job at a major Chattanooga company. When she was 8, her mother came with her to Dalton from northern Mexico to join her brothers already working in the carpet mills. Maria's mom worked there for years, until she recently was dismissed because she had no immigration papers. Although she herself has no documentation, Maria can work here under the Obama administration's Deferred Action for Childhood Arrivals program. It gives young people brought here by their parents illegally a renewable, two-year guarantee they won't be deported, allowing them to find work here. But Maria doesn't know if that will be dropped by the Trump administration. She's now supporting her mother, too, and is considering moving to a state that would allow her to attend law school. "Why not go back to Mexico to law school?" friends have asked. Maria says she has never visited the town where she was born, and while she can speak Spanish, her writing in that language is not good enough for law school, she said. So she is considering a move to New Jersey or Florida. "I have to look out for myself and my mother — I don't know if DACA will be renewed in a couple of years," she said. For now, Maria is protected by DACA until the end of next year. Christian Patiño, director of operations for Hispanic social services organization La Paz Chattanooga, said he knew of a young man who had his DACA permit and was trying to buy a home. "He has a full-time job," Patiño said, "but he is being told by the bank that they can't approve a loan because they don't know if he will be guaranteed a job next year." The uncertainty about the threat from the incoming administration is distressing to many immigrants, legal or undocumented. Many are acting to protect themselves, crowding local immigration attorneys offices to apply for any protected status for which they might be eligible. "They are seeking anything, even if it is not long term, so they at least have something in the system that maybe can protect them," Olsen said. Added Joe Baldwin, an immigration attorney with offices in Dalton and Rome, Ga.: "We've gotten a tremendous amount of calls from people who may have been putting it on the back burner in terms of getting their immigration issues straightened out — but now they are motivated by fear." Still, all the attorneys agreed any attempt by the new administration to quickly deport large numbers of undocumented immigrants is unlikely to succeed, because the current system already is overcrowded and facing major delays. The federal court in Memphis that hears Chattanooga-area immigration cases has a backlog of 15,000 cases, Olsen said. Baldwin said the earliest trial dates he is getting in those courts are for 2020. "I don't think a lot of people understand that the immigration system in general is already running well over capacity," attorney Lester said. "You would have to double the number of judges, prosecutors, jails, clerks — you name it. It's a very, very expensive process. No matter who is president, no president can just wave a wand and say 2 million people have to pack up and leave." There are about 44,000 people in jails and holding facilities built for 33,000, Olsen said. "If they start rounding people up, where are they going to put them?" Baldwin asked. "Are we going to build new federal prisons, or turn criminals loose to put immigrants in? I don't see that happening. The logistics are nearly impossible." Contact staff writer Steve Johnson at 423-757-6673, sjohnson@timesfreepress.com, on Twitter @stevejohnsonTFP, or on Facebook, www.facebook.com/noogahealth.